How special occasions are celebrated in our family is closely linked to food and thus a discussion may be started weeks before the actual event. Where shall we go? What will be cooked? Last year I took my daughter Nicola to the Cinnamon Kitchen to celebrate her birthday and its proximity to Christmas meant we were able to enjoy their wonderful Festive Tasting Menu. 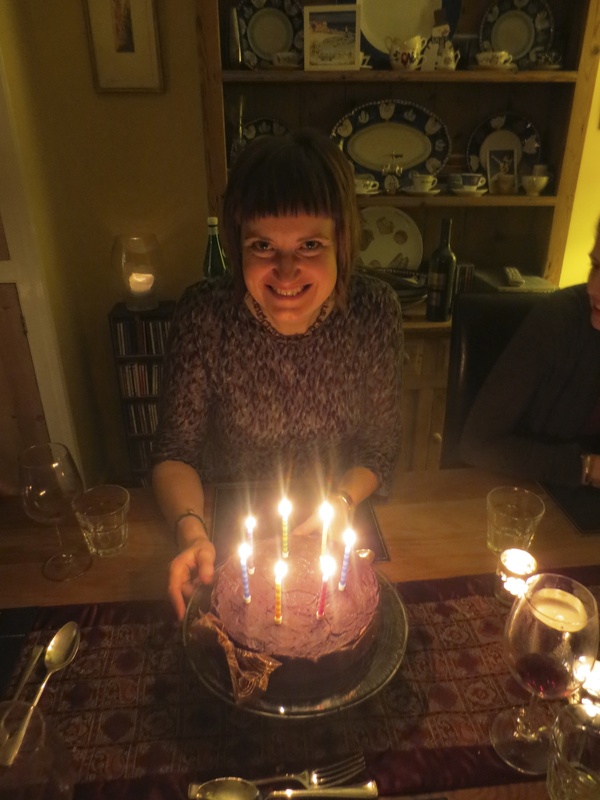 But this year she said well in advance that she’d like me to cook the birthday meal and to have her partner Rachael, brother Jonathan and sister-in-law Lyndsey come too. 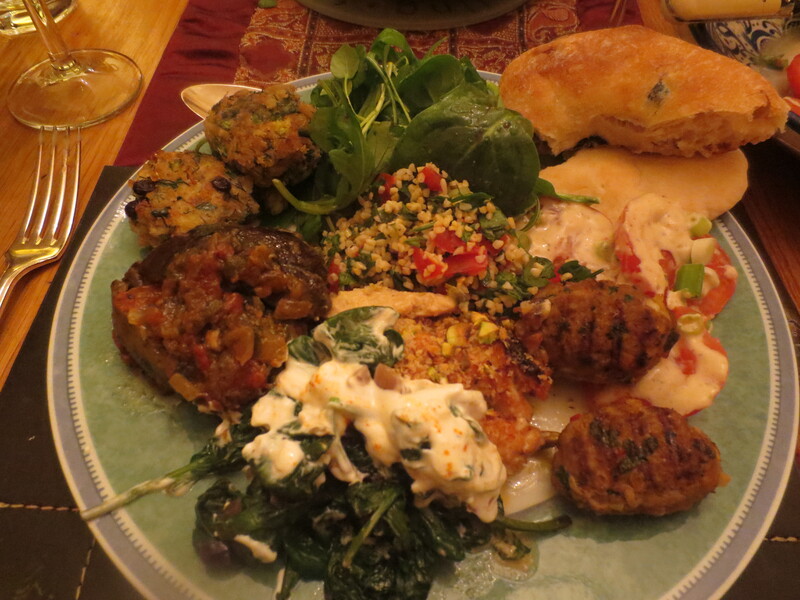 And because the discussion arose not long after I’d returned from beautiful Istanbul and was cooking up lots Turkish dishes with great enthusiasm, it was decided that the birthday meal would be a Turkish one: a selection of meze. We all love food of this kind, often going to Turkish restaurants like Tas or Pasha in London. 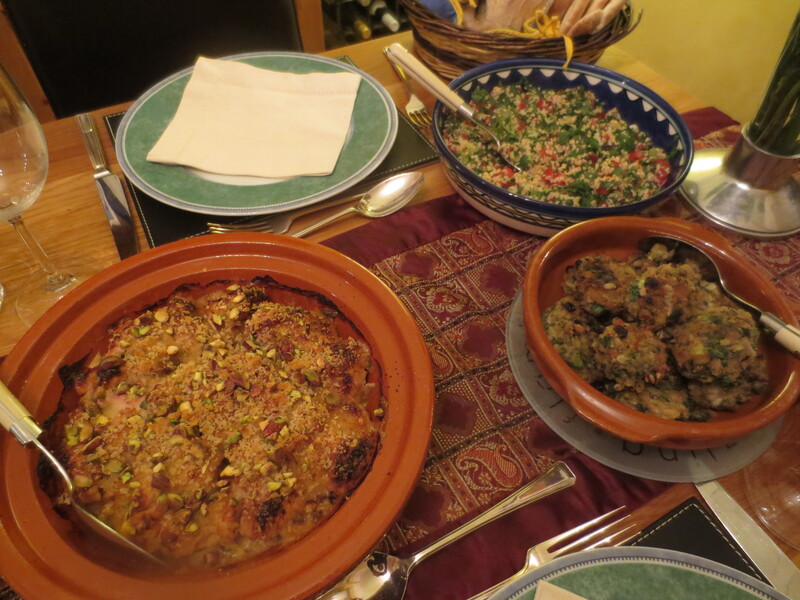 And it’s common for us to choose a meze meal: lots of small dishes brought to the table, some warm, some cold. Another advantage of this proposed meal is that Rachael is vegetarian and we always have plenty of meat-free dishes in a selection of meze so it’s an ideal meal for a vegetarian, with no sense of them missing out on the ‘main event’. 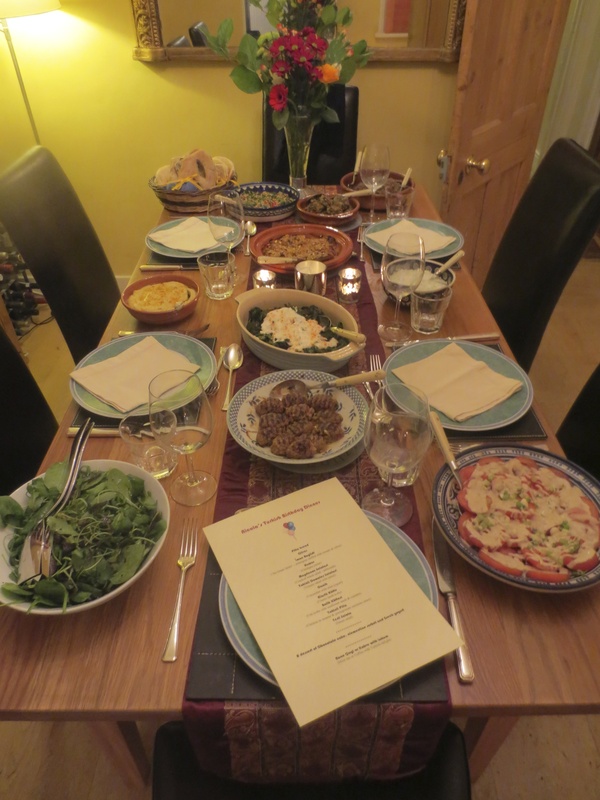 Fairly inevitably I got carried away with the menu, thinking of old favourites and some of the new Turkish dishes I’d made since returning from Istanbul and thus it ended up that there was a lot of cooking to be done. But it was fun to cast a day aside for cooking with the promise of an appreciative group of diners in the evening! Some things could be made early in the day: our favourite lamb kofte from Moro East and some fish kofte from Ghillie Basan’s Classic Turkish Cooking prepared and the Imam Bayildi made. 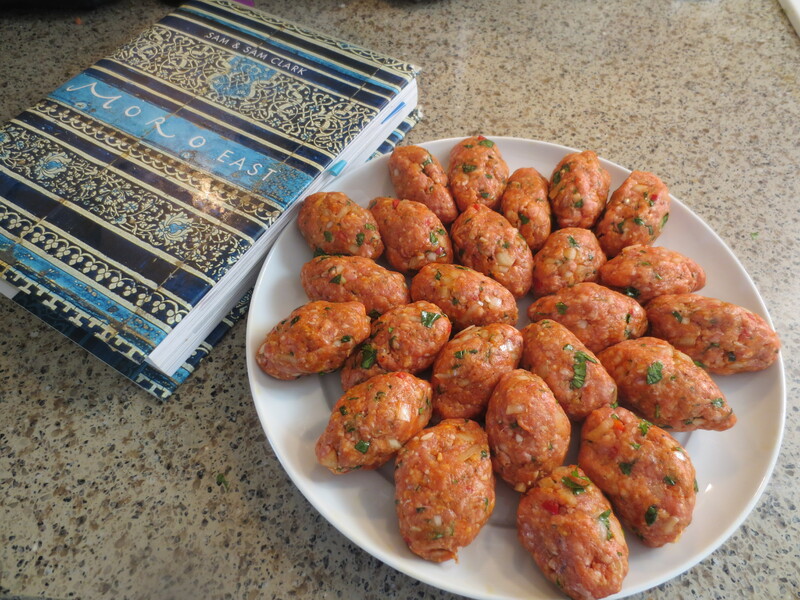 The kofte would have to be cooked at the last minute but without too much trouble, and the Imam Bayildi is delicious eaten at room temperature and stands being made a few hours in advance. I’d had a mad idea at one stage earlier in the week that I’d head into central London in the morning to buy real Turkish bread from the Tas deli near Waterloo and maybe some baklava, but it’s as well I gave up on the idea because really there was enough cooking on hand to keep me busy! I settled for some pitta bread from the supermarket but also bought some lovely fougasse in our local Paul bakery which is the most similar to Turkish bread I could think of. My favourite hummus recipe from Simon Hopkinson’s Roast Chicken & Other Stories was made early in the day and kept in the fridge till nearer suppertime. 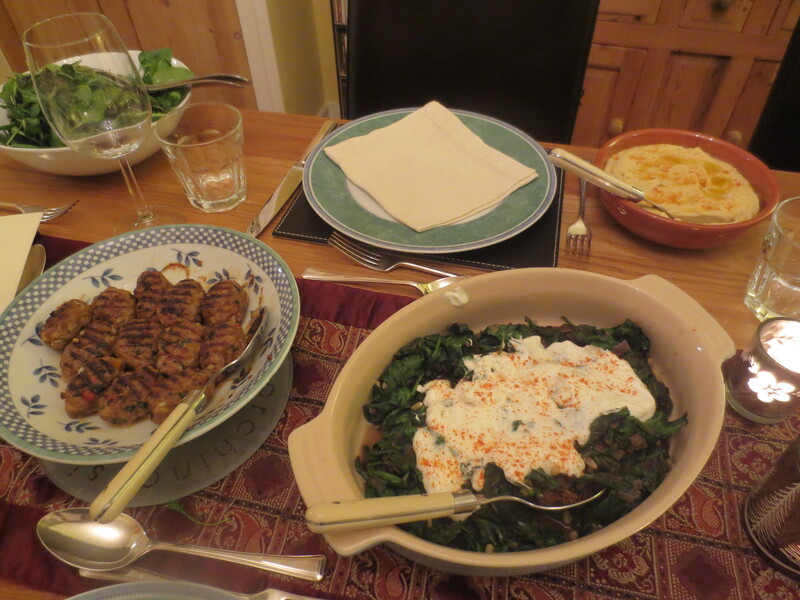 The gorgeous Spinach with Yogurt & Pine Nuts I first made soon after my trip to Istanbul, had to be made later in the day at the same time as the meat kofte were griddled and kept warm in a low oven. 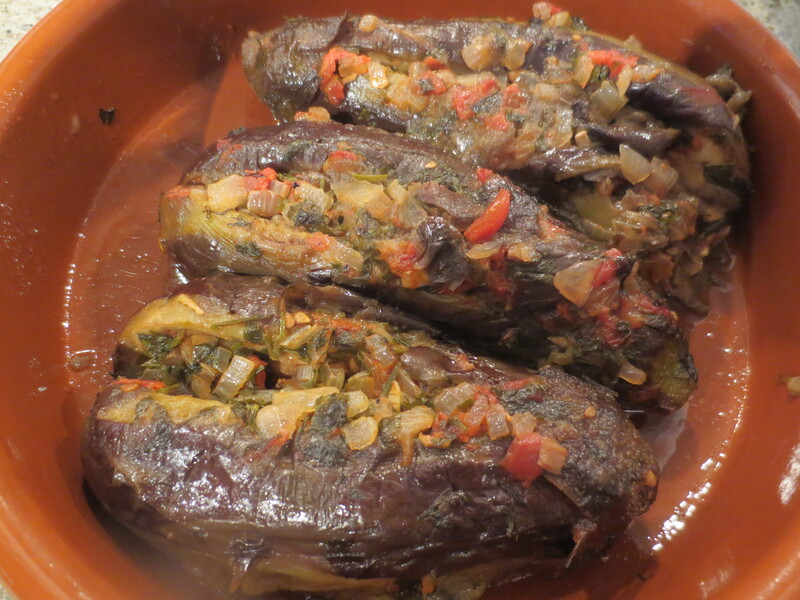 The fish kofte – Balik Koftesi – were a bit of a challenge in the end. 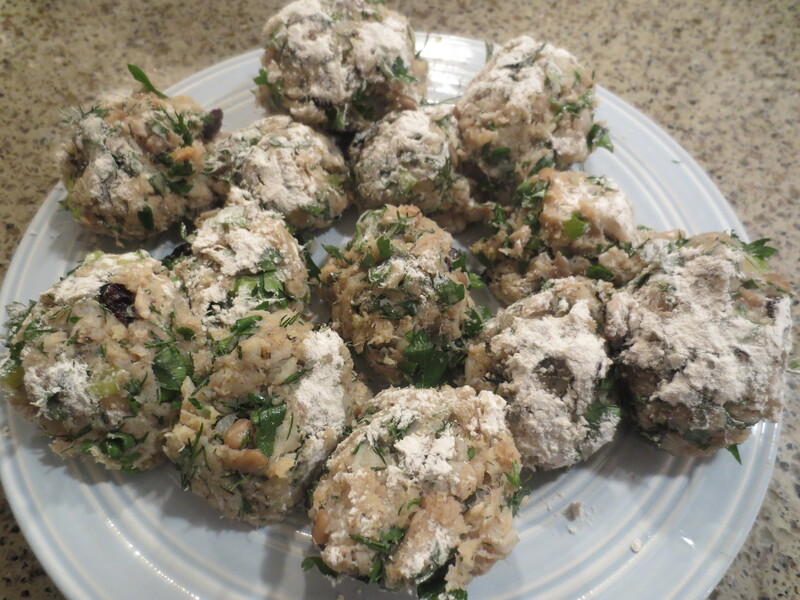 Making the mixture was fine but moulding them into little kofte shapes that would hold together was another matter. I did the best I could but some broke up in the cooking. 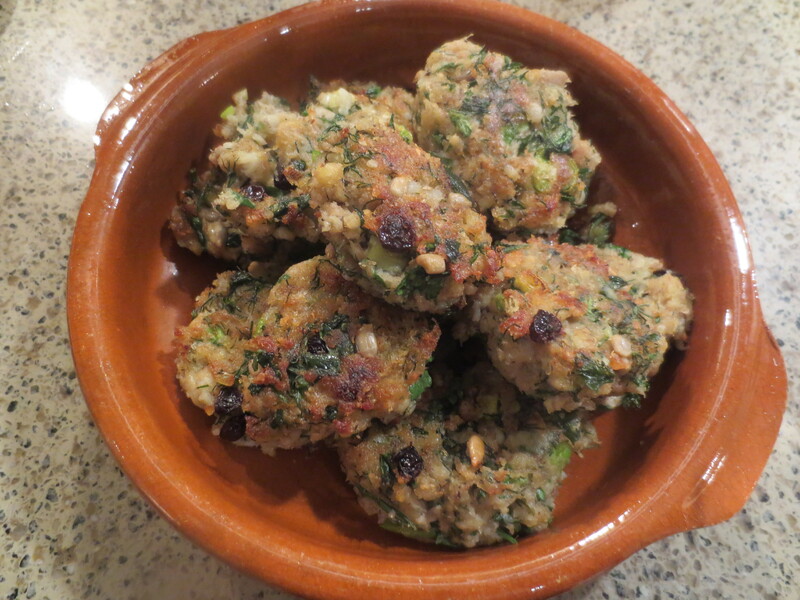 However, they still looked pretty good and tasted even better: a lovely blend of flaked cod, fresh parsley and dill, spring onions, currants and pine nuts and spiced with cinnamon and bound together with egg. 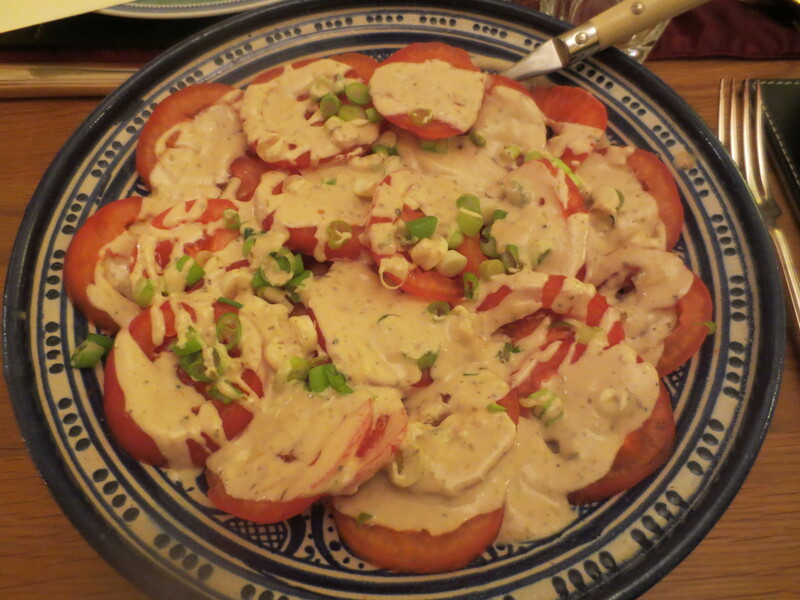 I found a lovely tomato salad in the Ghillie Basan book: large tomatoes skinned and sliced and dressed with a tahini sauce flavoured with garlic, cumin and lemon juice and some spring onions. There was Cacik – a Turkish version of Tzatziki and some Tabbouleh, with plenty of fresh parsley and mint so it was nice and green. I found a wonderful chicken dish in the Basan book too: chicken breast slices marinated in a tahini and pomegranate molasses paste then laid on a shallow ovenproof dish, sprinkled with breadcrumbs and chopped pistachios and baked in the oven for an hour. This was a great success. There was loads to eat in the end and we had huge platefuls! But it was all our favourite kind of food and everyone loved it. 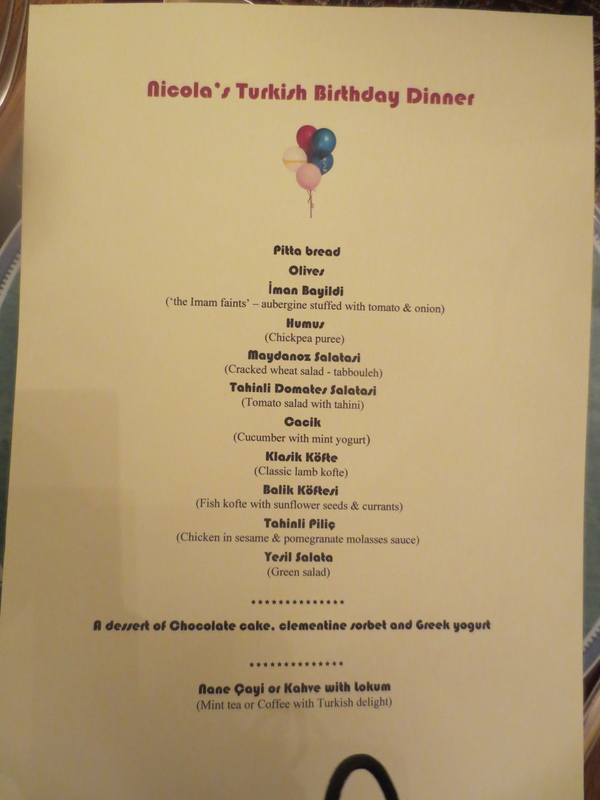 We’d begun the evening with a bottle of wonderful Ruinart champagne, had drunk some Primitivo with the meal (as Turkish wine was hard to find) and had a bottle of dessert wine in the fridge ready for the birthday cake. 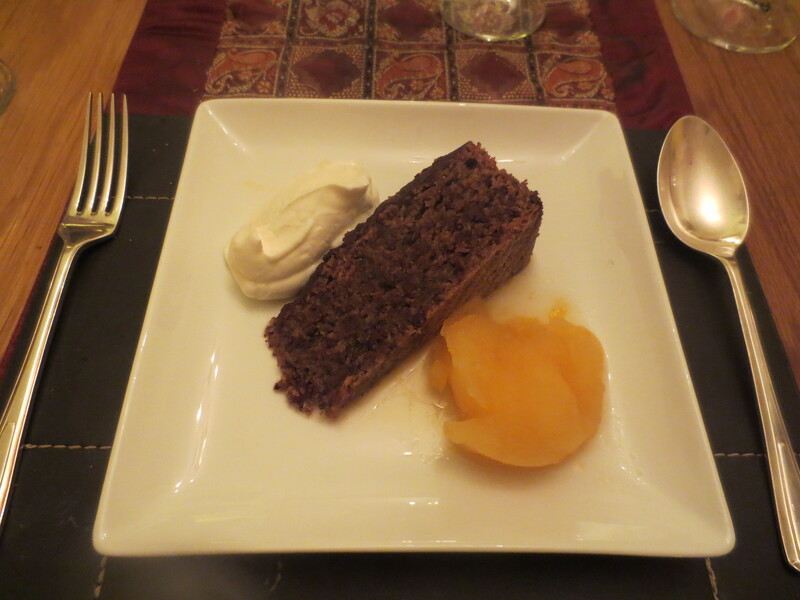 We ventured off Turkish piste for dessert. It had to be our favourite and usual celebration Torta Caprese which I served with the Clementine Sorbet I made the other day and some Greek Yogurt. 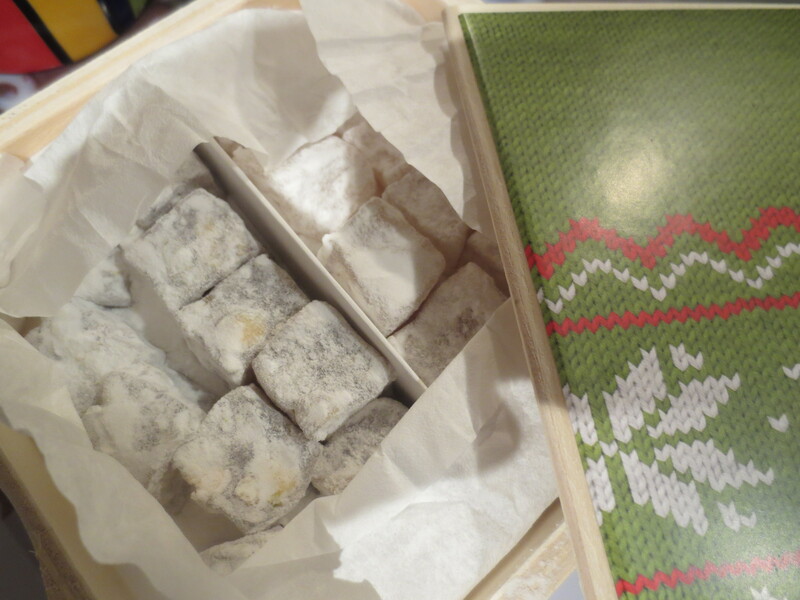 When we moved into my sitting room for either mint tea or coffee I felt I had to offer Turkish delight too as when we were in Istanbul it came with everything! It was such a lovely evening. I really enjoyed cooking the meal and it’s always so special to bring family together for a celebration like this. Appreciative is the key word, isn’t it? It’s not worth cooking for people who don’t appreciate all the hard work that goes into such an involved meal. I still want to know why this dessert is called caprese?